It was a sad day when I lost my iPhone headset a couple of months ago. Inspite of the fact that I knew it was an expensive loss, I tried to look at it on the bright side, because my ears will have some respite from being plugged into the iPhone mornings and evenings. And so it was just that for some weeks. But then I found that it was difficult hearing the person I'm talking to; must be because I just cut off a portion of the protective cover that came originally with the phone and a slit just exposes the earpiece. At any rate, I knew I had to get a new headset. But after finding out how expensive the iPhone headsets are, I decided to look for an alternative: just plain headset without the controller and mic. The furstrating part was, no ordinary plug will fit! The iPhone's plug is lodged way deeper than the regular jack can latch into. Sure, it's a regular 10mm interface, but the iPhone is padded in such a way that an adapter is needed to get regular headsets to work. I had a feeling that others have experienced the same challenge as I have. And Google confirmed it. Not only that; they have the solution I need! But a regular headset, cut-off a portion of the protective rubbery coating of the jack, and voila! It will slide right in! 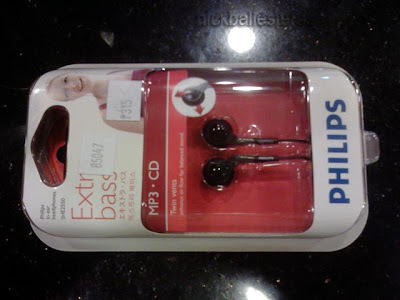 So for this experiment, I bought Philips headsets. After approximating where I should make the cut, I carefully made the incision around the rubber coating. And it did fit the iPhone! When you do this, make sure that you cut real carefully. I'm not sure if it's standard with all jacks, but this one had an inner white rubber cladding which protects the thin wiring and keeps it in place. Make sure that you do not apply too much pressure or you'll cut through this and through the wire as well. Just make a shallow cut, and try to pull the black rubber coating away. Chances are it will tear right off. Now I use my headset for audio, and for making and taking calls (while using the iPhone mic to talk to). Not too bad a compromise, considering I saved thousands for this innovation. 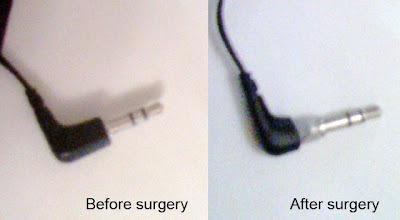 UPDATE: Here's another way to get an iPhone headset without breaking the bank.